Castor oil is used for lighting up temple lamps in Tamil Nadu. It is also used as a medicine. Castor oil is given to pregnant women and children for easy elimination and to avoid constipation. There is a saying in Tamil which stresses the importance of oil. 'Vaithiyanukku koduppathai vaaniyanukku kodu'. If you spend money on oils, you can save money treating diseases and ailments. This stresses the role of oil in preventing various ailments. Castor oil is known for its laxative benefits. Its hotness initiates action by digesting the undigested food residue and cleances the system by helping in proper bowel movement. 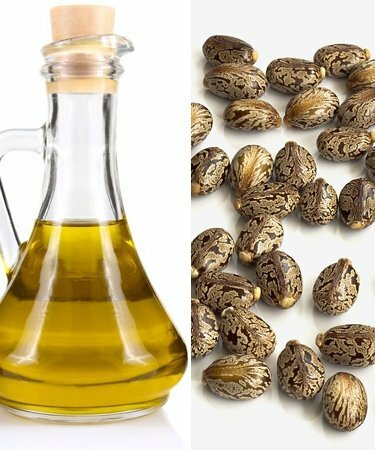 Castor oil is also used in treating stomach pain, abdomen pain, body heat etc. Castor oil is applied liberally in the naval area around the belly button for this purpose. This is said to bring down the body heat as well as relieve stomach pain etc. In case of inflammation of the eye due to body heat, redness etc, castor oil is mixed with mother's milk and instilled into the eyes. This rapidly cures the redness of eyes. Castor oil is also used in treating dysentery due to 'body heat'. 'Sweet flag' is burnt in castor oil lamp and the ash obtained in mixed in honey and given to the person suffering from dysentery. Constipation is considered to be the root cause of most of the diseases that afflict modern man. Fast food is one of the prime cause for constipation. Constipation leads to formation of hemorrhoids or piles. Castor oil is used extensively in treating constipation. It expels accumulation of gas in stomach. It drives out intestinal worms and pacifies vatam. It relieves mental tension and cools the body and mind. I've been looking for some good herbs for pregnancy and was wondering if castor is also good for pregnant. Or if it is even safe? More power to your blog!